The It Girl by Cecily von Ziegesar is about a girl named Jenny who has a mischievous past. She is ready to start a new life, school and most importantly a “New Jenny.” Jenny Humphrey is starting at Waverly, a boarding school in New York where most wealthy people go to. Throughout the book, Jenny is determined to leave her past behind and not go back into her foolish old ways. Rumors are flying about her past life in New York and she is developing a crush on Easy, the boyfriend of one of her roommates. How will Jennifer Humphrey make it through her first year at Waverly dealing with her past, parties, boys and gossip? Have you ever encountered a book that makes you want to flip page after page nonstop just to see what happens next? This is how I felt while reading The It Girl. I loved even the most simplest quotes for an example “At Waverly, Jenny was going to be stunning, amazing New Jenny, the girl who belonged at the center of everything.” I thought the book was amazing, I loved the drama and the all the gossip. In the book, the drama was so juicy, and it was actually quite funny and entertaining, but I hope high school isn’t like this for me. But I do have to say that it is a book for a mature audience because of some content in the book. 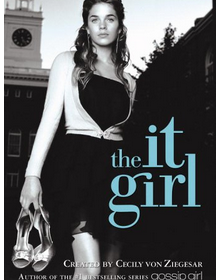 If you love drama, gossip and boys, The It Girl is perfect for you to read.